I just discovered the scan icon on my Goodreads iPhone app. What I thought would be a totally manual process of entering my 2,000+ library of books into Goodreads has now turned into a manageable project. I just scanned a dozen and entered them in about ten minutes. You can even scan a whole bunch at a time and put them on the same shelf – read, to be read, or whatever. This is a project I’ve wanted to do for years – catalog my library. I have only a few worldly possessions I would miss if I did not have them. 1) My computers. I make my living with my computers. Without them I would not be of much value to my employer. 2) My car, of course, because I live in Southern California and could not work the weird schedule I do without it. 3) My books. Ah, my library. I confess it’s a source of pride. I know that’s wrong. I love to collect books. When I get a new book, it’s usually on the recommendation of someone I trust. When I receive it, I scan through it, become familiar with the contents, decide if I want to read it right now and either read it or add it to the library, intending to get around to reading it someday. I know where this thing about books comes from – my mother. I grew up surrounded by books. 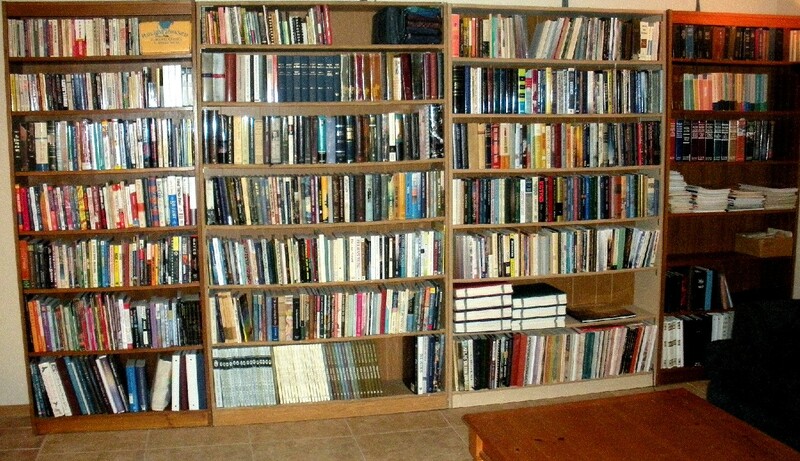 Every room in our house growing up had a bookcase. The front room had hundreds, perhaps thousands, just like mine has now. Each bedroom had its own bookcase and mine was filled with Caldecott and Newbury award winning books. Mother made sure we had the best books to read. Family trips to the local public libraries each week was my favorite thing to do. We did not grow up with television in our home so reading was the main activity of my youth. My mother read to me nightly and we read out loud as a family. It was an old cheap brown-covered Book of Mormon that I remember reading with my mother the year our family found and joined the church in 1962. She would mark out all iterations of the phrase “and it came to pass” as she read. “Didn’t sound like good English,” she said. I didn’t mind. I just learned to skip them when it was my turn to read. So I literally learned to read with the Book of Mormon before I was five years old. It’s no wonder I love this book. It’s special to me. I’ve connected to it through all phases of my life. In High School I developed a love for Science Fiction. I read Tolkien’s Lord of the Rings series before it became popular. I read the Dune series by Frank Herbert – loved the books, hated the movie. Arthur C Clarke, 2001: A Space Odyssey, then Isaac Asimov Robot series, Robert Heinlein – Stranger in a Strange Land, Ray Bradbury – Martian Chronicles, Fahrenheit 451, Jules Verne, H.G. Wells, Michael Crichton. I read all the classics for many years in my youth. Sadly, I stopped reading fiction after high school. I got a degree in computers and started my career and family. I read technical manuals for fun. I dug into books on programming techniques and network protocols, phone systems and the Internet. I make my living supporting computers and networks. I work for a private jet management and charter company at a local Southern California airport. I read a lot of news and blogs, especially in science and technology. But I still don’t read a lot of fiction. In fact, I’ve probably read less than a dozen fiction books in ten tears. I’ve always had an interest in disaster movies. I’m fascinated to see Hollywood portrayals of how people will react to a terrible tragedy of global proportions. Most of the disaster movies have been blockbuster hits so I’m not alone in my interest. Earthquake (74), Dante’s Peak (97), Deep Impact (98), Armageddon (98), Day After Tomorrow (04), Knowing (09), 2012 the movie (09) and When Worlds Collide, first made in 1951. I think somebody is working on a remake. I became deeply interested in Astronomy in college. I love the study of the Sun, comets, meteors, and the planets, especially the inner planets. I subscribe to an alternative view of cosmology different from the astronomical standard model, something called the electric universe. One of the most radical ideas of this alternative model is that the sun is powered directly from an external source, not necessarily by internal thermonuclear fusion. I know it goes against science. For about the last four or five years I have been taking professional writing classes and seminars, mostly with Carol. She has been much more serious about this than I have. Her first novel has been accepted and will be published within the next month or two. Things move fast in the world of e-publishing. I’ve been thinking it’s time for me to catch up and finish the novel I started. I read a disturbing statistic the other night. “According to one conservative estimate, upwards of 30,000 writers in the U.S. are currently struggling to write or publish their first novel. Perhaps .001% of them will be published at some point.” Wow. What makes me think I could write a novel that anyone would want to read or buy? I know some of those 30,000 aspiring writers. I know a few of my readers have ventured up to the top of my blog section entitled “Red Sky – LDS Fiction.” It contains PDFs of the drafts I have taken to our monthly writer’s groups where we read and critique each other’s work. I have received some good public and private feedback. Some of it has been not so good. Sections need to be rearranged; some corny dialog chopped. Writing is a lonely business. It takes discipline. You’re supposed to set a reasonable goal for yourself and then churn out X number of words per day. Perhaps I haven’t wanted this published badly enough. It’s been on my mind a lot more lately. I know I’ll regret if I get to the end of my life and don’t at least finish, edit and try to publish the book. I can see it in my mind’s eye now. I can name about ten projects I have put on my plate, could be working on and never seem to be able to make more than a little progress on any one of them. Do any of you have that same problem? I’m wondering if this Goodreads library scanning project is just another one that has now gotten in the way of finishing my book. It makes me wonder what I’m trying to avoid. Everyone has to ask themselves what they fear most about success. What if the book really does take off and a legitimate New York Publishing house wants a contract? I already know an agent who has said she would be happy to represent me based on what she has read so far. What about movie rights? Doesn’t every writer of disaster fiction want to see his book made into a movie? Then, of course, the book could be awful. It could be something that is not interesting to a large number of people – critical to success in book publishing. Poor grammar and weak sentence structure can be overcome with good coaching. I know one of the best who has offered his services for a very reasonable rate – $50 an hour. He has helped hundreds publish their books. When I pray about my book, I can see the chapters in my mind’s eye. Someone is trying to help me. I know the story. I know the scriptures on which it is based. I think my characters are at least a little bit interesting, or so I’ve been told. The dialog is good; the action scenes are fast paced. So why do I have this self-doubt? I suppose it’s because I’ve seen others write books that failed. For my regular readers, I hope you’ll excuse this public foray into musing about my alternatives. There is no discussion of theological doctrine here, no thoughts offered about how I think things could be better if we only did this or that, and no revelations of some inside tidbit of information derived via email from a high-ranking source inside the church office building or elsewhere. They say that making and announcing a public goal helps to get it accomplished. I’ve heard of people who lose weight this way. I know of people who get projects done when they tell their family and friends it will be completed by a certain period of time. I guess they hope that others who love them will ask them occasionally how the project is going and when it will be finished. So I’m going to go out on a limb here and commit myself to finishing my book by December. I’ve got over a dozen chapters written. Most need additional editing or rearranging. I probably won’t use them all in the finished book. I’m thinking I want this book to be about 180 pages. Although my genre is disaster fiction, the average science-fiction book is about 105,000 words. I’ve written about 27,000 words so I’m a fourth of the way through the first rough draft if I use all the stuff I’ve written so far. Of course, there’s all the editing to be done. Writing a book is a big project. How do people do it and still hold down a full-time job, take care of their family, church and social obligations? How do they keep that motivation to do the hard work of churning out another 1,500 to 2,000 words when they come home after an hour commute from the office? I think the answer to motivation is that you’ve got to have a story to tell and you’ve got to be passionate about it. I believe I’ve got one but I’m going to split this post in two and give you a rough outline of the story and why I think it’s exciting. According to my stats I have a couple hundred regular readers plus the one-time readers who come for my review of Visions of Glory. I invite your opinions. That’s enough of the background story. The bottom line for me is that I’ve made a promise to a friend to write this book and I intend to fulfill it. I’m excited about the possibilities of the story and the feedback I’ve received each time I share a chapter in a writer’s group. An early chapter was published in my college literary magazine awhile back. Let’s skip to part two of this post. Good luck to you, Tim.